1. On my way down to take my daughter to my sister while I ran yesterday we ran into my brother, father, uncle, aunt, and my husband who were sorting pairs of cows off. This usually is slower work and you have to be care to make sure you have the babies and the mama cows matched up correctly and they know they are traveling together or you can have cows/calves running back looking for whoever they think is missing. 2. 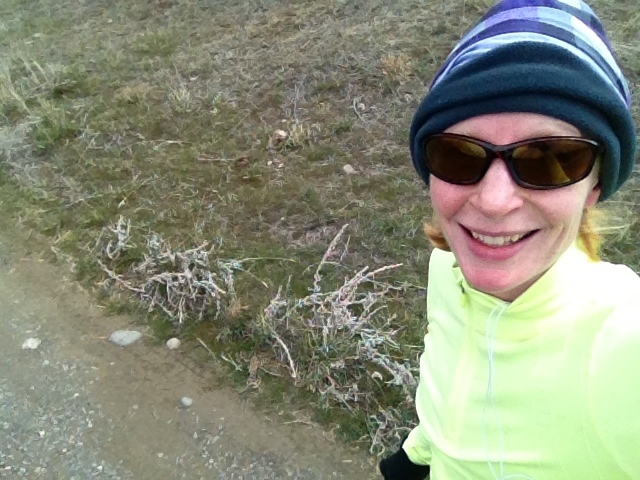 My run was good, it was also fueled in part by the birthday cake I made my Dad (Happy birthday yesteray Poppa!). I spent most of the time thinking about all the people who lived through what happened on Monday in Boston and the three who didn't. Instead of complaining about the cold weather and the continual intermittent snow we have had the last 5 days I embraced it. Instead of hating the hills I had on my route today and how much harder they were making my 400 intervals I embraced the hurt and ran hard for those who today cannot. I marveled at the feel of moving my legs, my feet pounding on the ground, my lungs burning as I tried to sprint up yet another hill. I soaked up the beauty all around me and laughed at the small snowflakes hitting my face. I paused a moment to watch a herd of deer bound over a hill away from me. I waved to the truckers on the interstate honking at me. Life is good and beautiful and I am so blessed. Yesterdays run was dedicated to Boston and all the incredibly moving recaps of the what people went through on Monday. I have read so many that have just brought me to tears. 3. My little sister is moving to Virgina at the end of May and just came back from house and job hunting with her husband. She found this in the airport and had to bring it back for me since she knows how much I love my chapstick. Big fat boo for my sister moving, but yay for fun new lippy! Kind of makes me crave dill pickle potato chips! 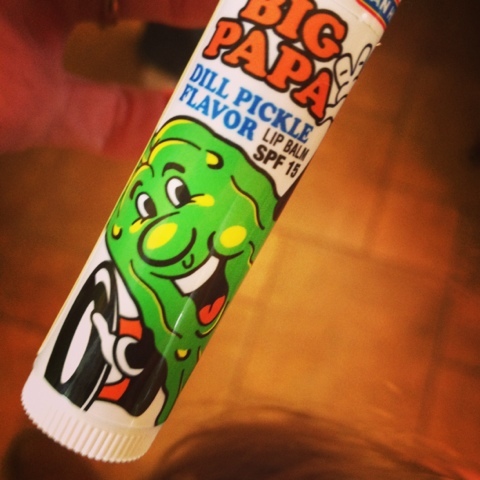 What do you think..dill pickle lip balm yay or nay? What is your favorite flavor of lip balm? Interesting - about the cows. I'd have to say nay to the lip balm, but maybe it would remind me of pickle juice, which is good for runners, right?! That chapstick sounds foul, but I would totally try it! That doesn't sound like the best Chapstick flavor to me but if you like that I suppose it would be delicious. I do love pickles but ... hmmm ... I'd probably try it. Not use it regularly but try it. Though there's so much grief and devastation around Monday, it's so amazing how the events have brought a community together and helped us all fall in love with running a bit more. I know this week that when I was hurting, I told myself it couldn't hurt as much as what those in Boston were going through. I hope we're always quick to remember the gift we have to run. It's been great seeing everyone's runs they are dedicating and all the groups coming together in support. ewww dill pickle chapstick, does it stink? I think I could try Dill Pickle chapstick, because I love pickles. But, I am a Chapstick girl all the way. Love the original (black label). Not a huge chapstick person, just give me the plain stuff. Although who doesn't love pickles! Dill pickle chapstick? I just don't know. I do love pickles though. I do love dill pickles but lip balm? I kinda don't thiiiiiink so. And I agree.... love cowboys. Have been blessed to have a few in my life, too. Cake is the best kind of fuel! Pickle lip balm...sounds interesting! I definitely never turn down anything dill but this is a bit of a stretch. How is it? 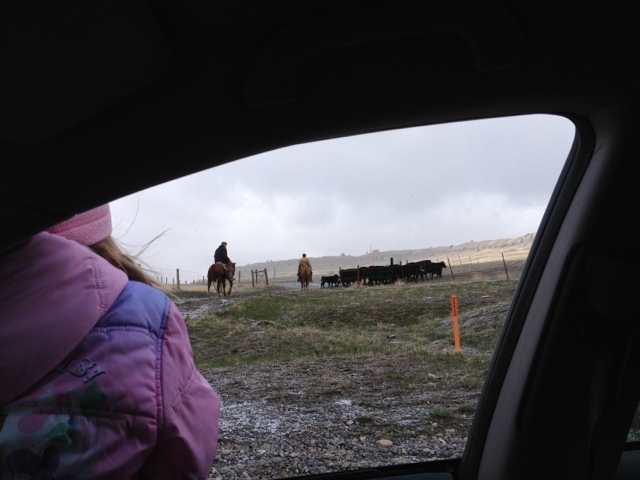 That picture with your daughter's shoulder and the herding in the background is really nice. It captures it so well. It's been such a week for runners, for everyone. I appreciate your spirit of honoring the good that so many displayed in the face of such horrific violence. So much. I don't think I could do dill pickle lip balm. I am more of a Burt's Bees kinda gal. I love dill pickles; I love chap stick. Why not put them together!? Ha, that is crazy, but I LOVE pickles so I would try it! Where in VA is she moving?